Union Station was everything I had remembered. A big space with a ton of marble. I ran with my surfboard, rolling duffel, backpack and new purse to the ticket office. 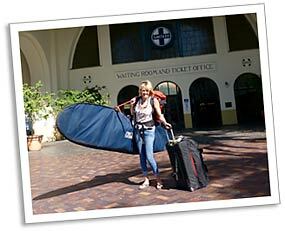 “San Diego Surfliner please.” I walked quickly to baggage – down a few halls to a buzzer. “You’re late!” Using my best BS skills they decided to take my surfboard and luggage. As they told me to be on time in the future, one guy made a comment about a “50 lb limit.” Well, it was obvious that I was packing close to 150. The ticket and no baggage fee from Los Angeles Union Station to downtown San Diego was $37.00. Once on the train I thought I would cruse around and maybe have a big breakfast. No way. I sucked down my Starbucks and made a mess of a croissant, which was inhaled. And from that point, I was glued to my view of the Southern California Coast I knew so well. As a child when the smog was bad in L.A. – my mom would put me on this same train to see my grandparents down by Oceanside. They grew avocados and oranges in Vista. I have asthma, so the reprieve helped me breathe – in so many ways. Two hours and there was my Reel Women business partner, Jennifer Cornell. Jen Jen and her boyfriend Skip had the truck, Linus the dog and months of living supplies waiting for me. Baja baby! A two day drive down through Baja is partially nerve wracking for some and major nerve destroying for others. The three of us and Linus were all alert – but it didn’t keep us from a cold Tecate Light now and then. I had no expectations. Really. I thought, “Well, if I can still surf I’m stoked.” Jen has been talking about her place in Baja for years. And there I was, loving it. We had small friendly surf – perfect peelers for our long boards. 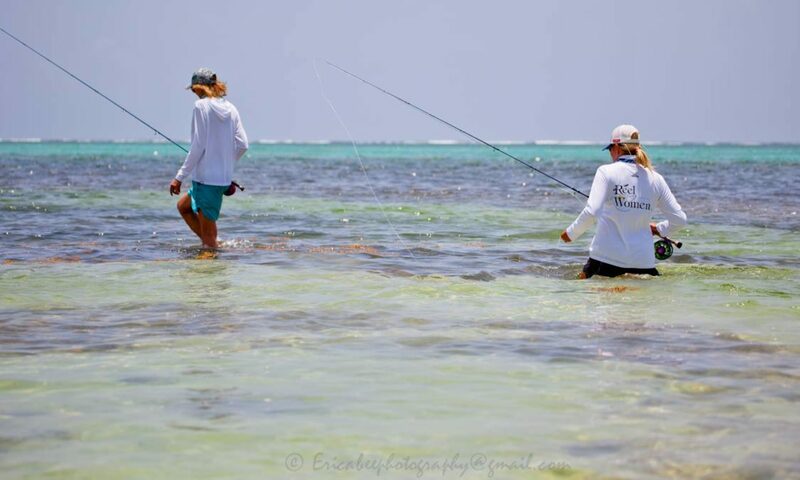 When the waves were too small to surf, we fished. We cast our 10 wts with floating lines to the surf and came back with halibut and corvina. Talk about amazing fish tacos! A Baja specialty that get’s better with super fresh fillets. It was a first for me – casting into the waves retrieving corvina. The waves were packed with fish. A Clouser and a super fast retrieve with a few “injured” moves caught fish. Again, a flashback to a picture I have on my dresser in Belize. My grandfather and his best friend wearing suits with two giant strings of corvina behind them from Ensenada, Baja. It must have been taken around the mid 1950’s. This is the time of year I’m usually stumbling over big slippery rocks chasing my beloved steelhead. It was a tough move for me to pull away from my fall ritual and mix things up. One morning after being in Baja for over a week I had that first “awake”moment which felt just like waking up on a favorite steelhead river. I felt something new was going to happen. Anticipating the morning surf and wondering how it was all going to go down that day was stirring up those same “wonder if I’ll ever get another steelhead” feeling. Turns out Jen, Skip and I all caught fun waves that morning. Riding waves screaming, “Awhoo!” Because we could. No one else was in the line up. Traveling around Baja brought back memories of when my parents threw us seven kids in the station wagon and headed to my Dad’s favorite Baja beach. The “Murphys” would arrive with car doors opening and the tailgate sliding glass window down as seven children, 5 1/2 years apart, crawled to the sand and Pacific. As I said to Jen and Skip – what a perfect thing to do when you have seven children and no money for fancy vacations. I found Baja again in my blood. Now I’m tortured with yet another place I would like to visit more often. Spending big pesos ended up being about $10 US a day. We ate fresh lobster, clams, fish and soft tortillas that never stopped being wonderful. We found we could paddle in waves and start to fly. Moments happen and then it all comes to trusting yourself. Voices saying, “Just stand up!” And with that move – an amazing ride. We found waves and fish. Like me steelhead season – I was united with my tribe. Friends who get it. Certainly not everyone understands our decisions. Maybe that’s part of the fun of it. But I do know that these times are the heart and soul of my life.